Welcome to brewing season 2014! With sunny weather and temperatures forecast to hit six whole degrees I knew it was time. We've had a long hard winter (and we still are having one, according to the inestimable Spring Indicator) but on this sunny Sunday, seeping tendrils of warmth would penetrate into Mount Breithaupt's deep, dark hibernation cocoon, and quicken the slow pulse of a sleeping dream. In other words, let's brew something already! 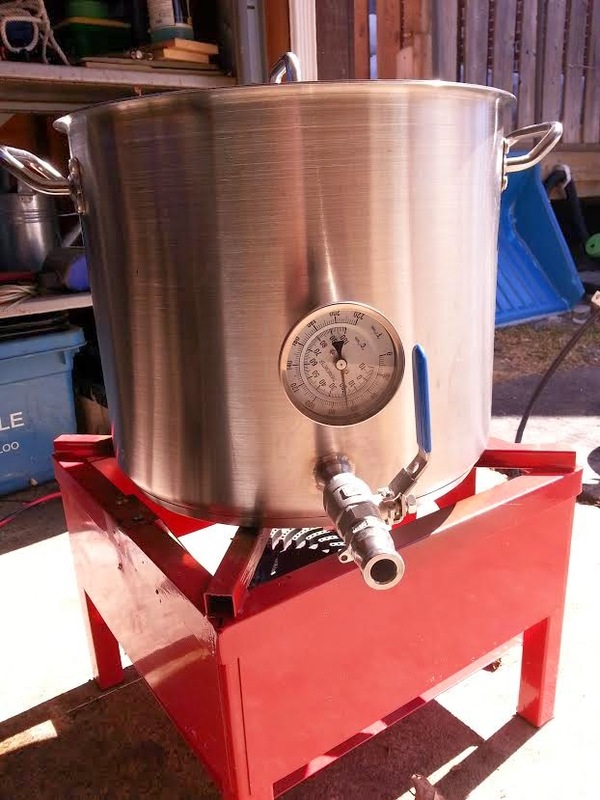 MBB is still transitioning to 10 gallon batches, and today was my first solo 10 gallon brew day. So, there was very little routine about it. I also have a new pump, pretty much a necessity when it comes to moving up to hundred pounds of boiling hot liquid. Old 8 gallon brew pot is now on mash water heating duty. And that pump only sprayed me a little bit in the face with acid sanitizer when I was doing an ill-advised sanitation/diagnostic run. It's a tricky beast. The worst part of it is that it cannot run dry, so the pump must always be located below everything, so it can be gravity fed before starting up. Of course, that places an electrical appliance closest to a potentially wet floor and underneath all the vessels full of liquid. At least the power source is GFI. 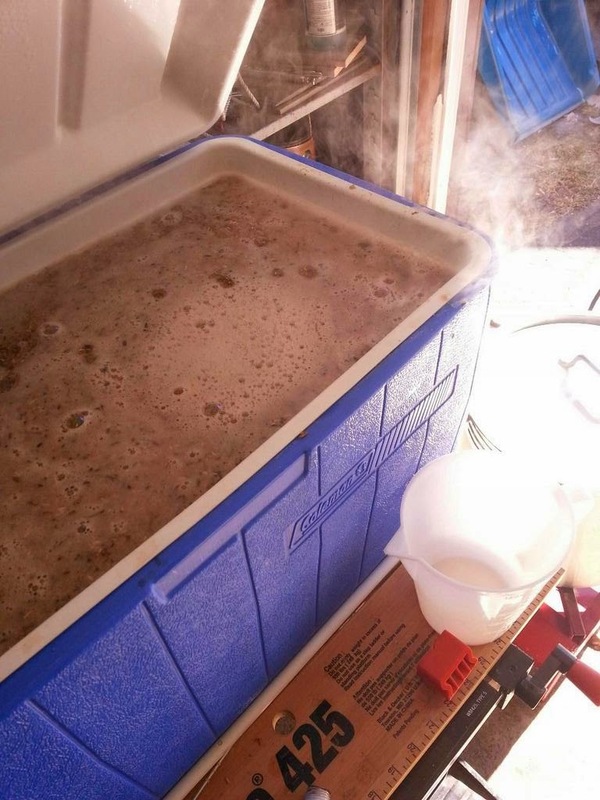 10 gallon batches really push this Coleman cooler mash tun to the limit. After all that, what I had was a pretty routine brew day, with a lot of head scratching moments when it came to logistics. And I learned I can't really stretch almost-empty propane tanks, as the burner output makes boiling 12 gallons really a long wait if I'm not getting a strong flame. Today's brew is an Amber Ale recipe adapted from Dirty Fawcett to fit with available ingredients. It's designed for simplicity, and for quick turnaround. After all, I have an empty keg fridge, and now is not the time to lay down a long-aging beer. Oh no. I want something quaffable by the time the deck is habitable. And the beauty of it? 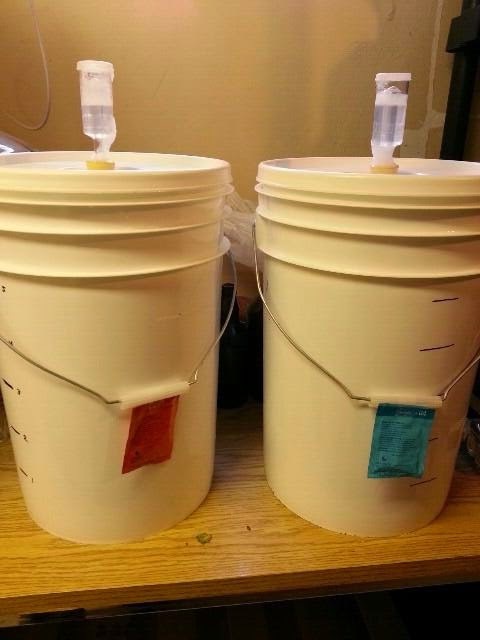 A 10 gallon batch means I get two kegs for the price (well, the effort) of one. Check out these beautiful twins. Different yeasts for each. Should make an interesting contrast! Still underestimating my system's efficiency. Pegged 77% and ended up with about 85%. As a result, this beer will be closer to 6% than 5%. I'd consider watering it down, but I have precisely the volume I wanted, and any more means I'd have to bottle the excess.